Biography of English Landscape Artist, Watercolour Painter. arguably one of his best. John Mallord William Turner, the leading light of English Landscape Painting, produced a large volume of watercolours, prints and oil paintings. His unique combination of Romanticism and down to earth realism had a significant influence on his contemporaries, including the French Barbizon School, and laid the foundation for the revolutionary landscape painting introduced by French Impressionism. Commonly known as the "Painter of Light", his most important works include Hannibal Crossing the Alps, (1812, Tate, London); Rain, Steam and Speed - The Great Western Railway, (1844, National Gallery, London), The Burning of the Houses of Lords and Commons, (1835, Philadelphia Museum of Art) and The Fighting Temeraire, (1838, National Gallery, London). He is rightly regarded as one of the best landscape artists in the history of European painting. At the age of 15, one of his watercolours was accepted for exhibit at the Academy, a very rare honour for someone so young and unestablished. His early works consisted mainly of drawings and watercolours and it took him some time before he felt ready to tackle the medium of oil. In 1796 he exhibited his first oil painting at the Academy, Fishermen at Sea, and continued to exhibit nearly every year for the rest of his life. By the time he was 18, he already had his own studio on Harley Street. Within 2 years print makers were eagerly buying his drawings for reproduction. Turner's early success allowed him the financial freedom to innovate, which he did so over the years. Important early works include Hannibal Crossing the Alps and Ulysses Deriding Polyphemus, 1829 (National Gallery, London). He travelled extensively throughout Europe, including France, Switzerland and Italy, but it was in Venice that he found true inspiration, and he returned many times throughout his life. He created lots of watercolours and oil paintings of the city, including The Grand Canal, Venice, 1835 (The Metropolitan Museum of Art, New York). Natural catastrophes and phenomena fueled his imagination, he loved to paint ships, fires, violent seas, storms and fog. These subjects were covered in The Burning of the Houses of Lords and Commons, Peace: Burial at Sea, 1842 (Clore Gallery, London), Rain, Steam and Speed - The Great Western Railway and Slave Ship (Slavers Throwing Overboard the Dead and Dying, Typhoon Coming On), 1840 (Museum of Fine Arts, Boston). The theme of the destructive power of nature had first appeared in his painting Hannibal Crossing the Alps and continued throughout his career. He liked to experience events at first hand; when he heard about the fire at the House of Parliament, he rushed to the scene immediately. One rumour had it that he even had himself tied to the mast of a ship in order to experience the drama of a stormy sea up-close. As his work matured, it became almost impressionistic in style, as he focused less on the details and more on the overall atmospheric effect. He became a master at rendering pure light by the use of shimmering colour. An example of this is the Great Western Railway painting where the train is barely recognisable. As far as Turner was concerned, his study of light was becoming paramount and he did not want objects in the painting to distract from this focus, preferring instead to concentrate on the play of light on clouds, water, skies and fires. His technique was being studied carefully by the Impressionists in France, in particular by Claude Monet. However, not everyone was pleased with his later work, one American buyer was said to be disappointed with the 'indistinctness' of his later paintings. Other important works by Turner include Staffa, Fingal's Cave, 1832 (Yale Center for British Art, New Haven), Norham Castle, Sunrise, c.1835 (Clore Gallery), Interior at Petworth, c.1837 (Tate Gallery, London), Moonlight, watercolour, 1840 (Tate), Sun Setting over a Lake, 1840 (Tate) and Landscape with Distant River and Bay, 1840 (Musee du Louvre, Paris). As he became older, he turned eccentric, and except for his father, who lived with him for 30 years, he had no close friends. He gave up meetings at the Royal Academy, and would not let anyone watch him paint. He still held exhibitions but refused to sell any of the paintings. When he was convinced to sell one, he was depressed for days afterwards. His last exhibition was in 1850 at the Academy, after which he went missing from his house. His housekeeper searched for him for months, finally finding him at his mistress's house in Chelsea. He had been ill for some time, and died the following day in December 1851. He was 76 years old. As he took his last breath, he uttered the words 'the Sun is God'. He was buried in St Paul's Cathedral and lies next to Sir Joshua Reynolds. The influential art critic, John Ruskin later described Turner as the only artist who could 'most stirringly and truthfully measure the moods of Nature'. Along with William Hogarth, Gainsborough and John Constable, Turner is considered one of England's greatest artists, and is just as popular in the 21st century as he was in his own time. In 1984 the Tate Gallery launched a new award for avant-garde art, called the Turner Prize, which has helped to launch the careers of now prominent artists like Tracy Emin, Damien Hirst and photographer/sculptor Steve McQueen. 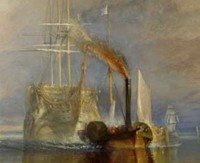 A major exhibition entitled 'Turner's Britain' was held at the Birmingham Museum & Art Gallery in 2003 and Turners painting the 'Fighting Temeraire' was voted Britain's 'Greatest Painting' by a BBC public poll in 2005. One of the great Romantic artists, Turner's earliest work is in water-colour in the manner of the topographical draughtsmen. Even in the light of his later achievements it is difficult to find signs of genius in these works of his youth. A drawing such as the "Lambeth Palace" of 1790, his first exhibited work, for example, is a competent and careful piece of architectural draughtsmanship, and though it is promising enough for a boy of fifteen, there is in it no hint of very exceptional powers. But during the last years of the eighteenth century he was gradually coming to the front among the water-colour painters and beginning to amass the prodigious knowledge of nature which bore fruit in his later work. At this time he was working mainly for engravers and making long tours on foot through England. Wales, and Scotland, making pencil-sketches of ancient buildings, abbeys, castles, and the like which he afterwards worked up into finished watercolours. It was a drawing of Norham Castle, exhibited at the Academy in 1798, which seems first to have established his reputation, though he must have attracted some attention before that. The following year he was elected A.R.A., a proof of the position he had attained. By this time he had followed Thomas Girtin in his broader and bolder handling of watercolour and was beginning to leave behind the tentative manner of his earliest work. The death of Girtin in 1802 left Turner the leading water-colour painter of the day, but his real career had scarcely begun. In the same year he made his first foreign journey, travelling through France and Belgium to Switzerland, and in 1803 he exhibited his great picture of "Calais Pier" (National Gallery) at the Royal Academy, his first important oil-painting. Hitherto his few oil-pictures had been dull and heavy in tone, uninteresting in execution, and altogether inferior to his water-colours. The "Calais Pier" in its way is a masterpiece, though it shows none of the brilliance and luminosity of his later work. In it he begins his long rivalry with the masters of the past, for his inspiration is certainly the work of the Dutch seascape-painters. In the drawing of waves he immediately surpasses them. Painters such as Van de Velde and Van de Capelle had painted pictures of smooth seas which had far more the look of water than this picture, but in painting rough seas their waves are treated too much as mere profiles without body or weight. Here Turner grasps at once the weight and volume of the water. The sheen on the surface of the water he has not bothered much about, but the sheer force and weight of the waves is terrific, and they are completely modelled as a sculptor would model them. The amazing truth of his wave-drawing was one of the points on which Ruskin based Turner's claim to superiority over the masters of the past, and in this first seascape there is full justification of the claim. No such sea had ever been painted before, and in this one point of wave-drawing it has perhaps never been surpassed even by Turner himself. 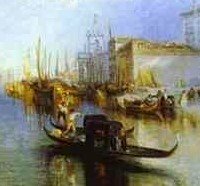 From this time on till 1819, when he made his first visit to Italy, Turner's powers as an oil-painter were gradually developing in rivalry with various masters, especially Claude. This rivalry with Claude reached its height in 1815, when "Dido building Carthage" (National Gallery) and "Crossing the Brook" (National Gallery, 497) were exhibited at the Royal Academy. 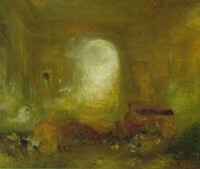 The "Dido" is a frank imitation of one of Claude's typical classical compositions, and in it Turner felt that he had at length surpassed his master, for he left it to the nation together with "The Sun rising through Vapour" (National Gallery), to hang for ever beside Claude's "Embarkation of the Queen of Sheba" (National Gallery) and "The Marriage of Isaac and Rebecca" (National Gallery). Opinions may differ as to Turner's success in this long rivalry, but there can be no doubt that he had learned much from Claude, and in "Crossing the Brook" he can be seen applying the methods of classical landscape to an English scene. Here the classical conventions are confined to the foreground of the picture, and in the distance and sky, Turner relies on his own study of nature. This is the part of the picture which inevitably draws the attention. It is filled with a delicate air and sunlight, and a sense of infinite detail, felt rather than seen, which Claude never achieved. 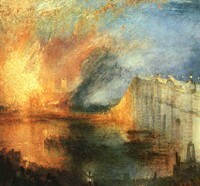 While this rivalry with Claude went on, Turner was at the same time deliberately emulating other masters. In the "Spithead: Boat's crew recovering an anchor" (National Gallery), he continued his competition with the Dutch seascape-painters. In "The Frosty Morning" (National Gallery), with its spare and austere scheme of browns and greys, he paid his tribute to Crome, and if it does not achieve Crome's dignity and force, it has a greater delicacy in its atmosphere, and the pale sunlight just beginning to melt the frost upon the grass. In "The Holy Family" he measures his strength with Titian, in "The Dragon of the Hesperides" with Poussin, and in some small figure-subjects he even enters the lists with Wilkie. In a series of little sketches, mostly in the neighbourhood of the Thames and Windsor, executed between 1805 and 1810, he approaches the manner of Constable. Meanwhile he continued to produce exquisite water-colours which were entirely his own. By 1819, the date of his first visit to Italy, he had already produced some of his finest pictures - "Calais Pier", "Crossing the Brook", "Walton Bridges" and "The Frosty Morning", are all masterpieces in their way - and he had shaken off the heavy tone of his earlier work. As a water-colourist he was without rival, and he could paint waves, skies, and distance as no one had done before, but his study of light as an end in itself had hardly yet begun. The brilliance of the sunshine, and the opulent richness of his pictorial material in Italy, at first almost overwhelmed him, and the earliest of his Italian pictures are not among his most successful, though they inaugurate a new phase in his kaleidoscopic career. Hitherto his pictures done in rivalry with Claude had been based upon material which Claude himself supplied, but now for the first time he saw the actual scenery which had inspired Claude, and he began to paint pictures still based upon Claude's general scheme of composition but with material taken direct from nature. The "Bay of Baiae" (Tate Gallery) illustrates this phase. There is much that is artificial in it, but it is pitched in a higher key than his earlier work, and begins to show a new system of translating the tone values of nature, and a new observation of the effect of light on colour. It was in his treatment of light that Turner was most revolutionary. The older masters had attempted to use the same scale of tones in their pictures as they found in nature, with the result that large areas of their pictures were forced into comparative blackness. Turner realized that he must translate the tones of nature into another scale if he was to preserve an effect of general truth, for the range of tone in nature from the full light of the sun to absolute darkness is far greater than the scale of the painter's palette from white to black. Consequently, if a painter employs the same tonal intervals as nature he reaches the end of his scale far too soon. This system of tones can be used fairly successfully so long as the subject represented comprises only a narrow band of the full scale of nature's tones, but in subjects of brilliant sunlight, such as Turner dealt with in later life, it becomes impossible. He overcame this difficulty and achieved an effect of general truth by greatly reducing the tonal intervals in his pictures. If we take the conventional figures of 1,000 and 100 to represent the full scales in nature and in the painter's palette, then Turner represented an interval of one tone in nature by one-tenth of a tone in his own scale. It is highly improbable that Turner deliberately worked out any scheme of this sort, and certainly he did not use it consistently if he did so, but these figures do give a general indication of the way in which he solved the problems of representing brilliant light. Beside this he studied with more accuracy than had ever been done before the exact effect produced by light and atmosphere upon colour. He noticed, for example, that shadows tend to be of the complementary colour to their corresponding lights, instead of being merely a darker shade of the same hue. In both of these ways, in his system of tone and in his treatment of colour, Turner was a forerunner of the French impressionists, and it was partly the sight of his pictures in 1870 which led Claude Monet and Camille Pissarro to the development of impressionist technique. Turner's own attitude to nature was of course quite different from that of the French impressionists, who were wedded to exact scientific truth. Turner was concerned far less than they with the visual impression of things seen, and far more with the mental impression which they made upon him. He studied the visual facts of nature as a means of personal expression, and applied the knowledge which he amassed to the creation of glorious visions of colour and light, which are anything but literal transcripts from nature. Nature was to him as much a medium of the imagination as it was to William Blake, and his pictures have a deliberate poetry which is displeasing to some modern taste. The epic vein in his work reached its culmination in the magnificent "Ulysses deriding Polyphemus" (National Gallery), which was exhibited at the Academy in 1829, a glowing dream of richly orchestrated colour which pulsates with fiery light. After this date his work becomes more and more lyrical in feeling, and pure light becomes almost an obsession with him. The relation of light to form and colour in his later work is almost the exact reverse of what it had been in earlier painters. Among the earlier masters, light had been treated simply as the medium by which form and colour are seen. Later painters, Claude, Rembrandt, and others, in their various ways had come to appreciate the effects of light on things for their own sake, but in Turner's later work forms cease to have any significance at all, except as reflecting surfaces for light. In the "Interior of Petworth" (National Gallery) forms have become molten in the all-pervading radiance which is the real and only subject of the picture. In this and other later works, form and colour are simply the means by which light is seen. Much of Turner's later life was spent abroad, especially in Switzerland, northern Italy, and Venice, and almost to the end he was producing water-colours of these places which have an exquisite delicacy and beauty. His later work in oils was misunderstood in his own time even by Ruskin, and many of his most beautiful impressions of light and colour were stored for many years in the cellars of the National Gallery, from which they were rescued at length to be hung at Millbank. Some of these are much faded, for Turner was no more careful of the chemistry of painting than Reynolds had been. Others retain a dream-like loveliness which is without parallel in art. Oils, watercolours and drawings by Turner hang in the best art museums across the world. For exponents of Romantic landscape painting influenced by Turner, see: Hudson River School (fl.1825-75) and Luminism (fl.1850-75).  For more biographies of great painters, see Famous Painters.  For 18th century landscape painting, see: Homepage.